At Tibbs Fleet Services we offer comprehensive servicing and maintenance to all makes and models of trucks and all types of trailers. From an independently owned truck to complete fleet management solutions. Our workshop is open five days a week, and we also offer a 24/7 breakdown assistance service. To get you back on the road in no time. We understand how important it is to keep your vehicle on the road. So we offer a 24/7 breakdown service assistance. Our highly skilled and friendly mechanic technicians are available around the clock. To assist you with any breakdown so that we can keep you on the move. We strive to offer the best service to you and your business by keeping your vehicle’s downtime as short as possible. 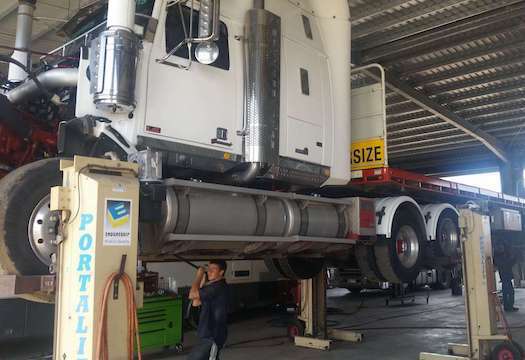 Our workshop is equipped with the latest diagnostic equipment so we can diagnose and repair your truck as soon as possible to get you back on the road. To minimise downtime for repairs, we stock a wide range of parts and accessories for most makes and models of trucks to keep turnaround as smooth and quick as possible. At Tibbs Fleet Services we offer comprehensive servicing and maintenance to all makes and models of trucks and all types of trailers. From an independently owned truck to complete fleet management solutions. Our workshop is open six days a week, and we also offer a 24/7 breakdown assistance service. To get you back on the road in no time. Tibbs Fleet Services have serviced my P400 for the past five years. As a subcontractor breakdowns are a problem because as we all know “ If the wheels aren’t turning we’re not earning. Over the past five years Tibbs Fleet Services have gone above and beyond to help keep my small business rolling. I have always had Tibbs Fleet Services for my servicing and breakdowns as they are very reliable and super prompt as they understand the importance of keeping the wheels turning. Tibbs Fleet Services has provided RWC certificates for vehicles we have bought at auction to add to our fleet. We can completely trust the team at Tibbs to give a through and truthful check of all our vehicles. They have serviced our private vehicles for nearly 10 years and we have complete faith and trust in Peter, Jeff and the team. When the job is complete, they run through the complete diagnosis in detail and explain everything in "normal" language.